New Studies Confirm the Surprising Relationship Between Sugar, Insulin Resistance, and Heart Disease. IMPORTANT health information follows. More people need to know about this so please read this article and pass it on. Accounting for 17% of all deaths (according to the WHO) and killing over 616,000 people in the United States alone in 2008. As you can tell, heart disease not only kills but it weighs heavily on the health care system of a country. For years it was believed that eating too much fat was the cause of heart disease. And for that reason, the 1980s saw a a new “low-fat” movement. However, heart disease still increased. And so too did obesity. If fat was the problem then why were (are) people still having more heart attacks, getting fatter, and even developing Type 2 Diabetes? Well, a big part of the answer is SUGAR. As I’m about to show you in this article, sugar is a big reason why 1/3 of Americans have high blood triglyceride levels, making them (maybe even you) more susceptible to a heart disaster! Don’t be fooled by low-fat products because if fat has been reduced or removed, then manufacturers know that something else has to take its place. In many cases, it’s sugar. So why is sugar so bad? Well, it’s a DRUG that literally destroys every cell and system in your body and although I won’t be touching on every one its deleterious health effects in this article, I will be discussing the rarely talked about relationship between sugar, insulin resistance, and heart disease. After reading this article, I guarantee you’ll never look at sugar the same way again. This really comes as no surprise (after you understand how all this works) but a March 2012 study in the journal Circulation with 42,883 men found a significant and positive association between drinking sugar-sweetened beverages and the risk of coronary heart disease. In fact, the researchers revealed that for a one serving per day increase in sugar-sweetened beverage intake, the risk of CHD increased by 19%. If you thought that drinking a pre-packaged fruit juice or soda pop was only doing damage to your waistline, then think again. This is just one of many studies showing sugar’s detrimental effects on the heart and cardiovascular system. As we’ll look at below, fructose (which makes up roughly 50% of the sugar molecule sucrose as well as high-fructose corn syrup) is perhaps the main culprit here. Well, among other reasons, the liver has a very tough time metabolizing fructose (as opposed to glucose). In fact, roughly 30% of fructose intake is converted to fat in the liver. One of the ways this happens is through a process known as de novo lipogenesis (or “new fat creation”). 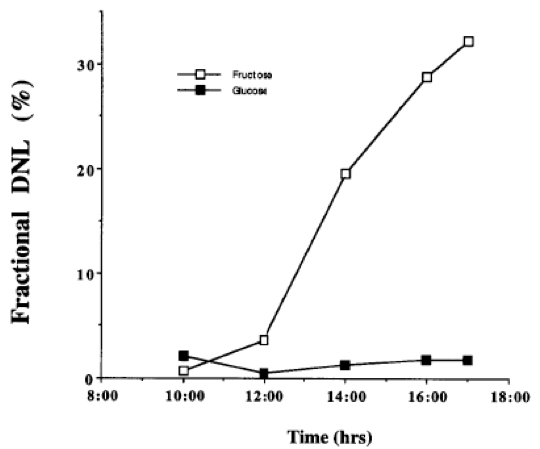 And to give you an idea of how dramatically fructose impacts this process have a look at this graph comparing glucose and fructose on de novo lipogenesis (DNL). Notice the dramatic rise in DNL after fructose consumption? Not only does fructose (ie. sugar) add more fat (in the form of triglycerides) to your bloodstream – not a good thing by any stretch of the imagination – but also stresses your heart and vascular system by increasing blood pressure. Well, one of the by-products of fructose metabolism is uric acid. You may have heard of it before. It’s the precursor to and problematic compound associated with gout. But in this case, uric acid increases blood pressure by inhibiting an enzyme that allows nitric oxide (NO) – a powerful vasodilator – to do its job. Thus, if NO can’t dilate your blood vessels, then they will naturally be “less open”, leading to an increase in pressure as blood travels through them. The combination of increased fat production and the creation of uric acid are just 2 ways that sugar puts you at greater risk of heart disease. Considering that in 2004 sugar-sweetened beverages made up approximately 7% of the total daily energy intake of Americans, it’s no wonder heart disease is still killing more Americans than any other disease! Above, I mentioned that fructose is bad news. But that does that mean that fruit is bad for your heart too? Well, first of all, fructose is only a portion of the sugar found in fruit. Some fruit have more, some have less. But either way, fruit is a natural whole food and if anything should be eaten in greater amounts to prevent heart disease. A 2011 study assessed the effect of low glycemic index fruit intake in type 2 diabetes and whether or not it increased the risk of cardiovascular disease (CVD). Temperate climate fruit, which are generally low GI, were the focus and included apples, pears, citrus fruit (oranges, tangerines and grapefruit), berries (strawberries, raspberries, cranberries, blackberries and blueberries) and the Prunus family (nectarines, peaches and plums). Not surprisingly, the low GI fruit consumption was associated with lower blood pressure and CVD risk and supports a role for low GI fruit consumption in the management of type 2 diabetes and heart disease. This just goes to show that WHOLE foods are the secret to life-long health. Fruit aren’t problematic because of the large amount of fiber that they contain, which naturally slows down the amount of fructose that reaches the liver at any given time. Therefore, the liver can more easily process the fructose from fruit, meaning less of it is converted to fat. Plus, fruit is loaded with antioxidants, which are very important for fighting off free-radicals and preventing oxidative damage in your arteries. So go ahead – get your 8-12 servings of fruits and veggies! To further understand how sugar eventually leads to a greater risk of heart disease, we need to start at the beginning. When you eat sugar (specifically glucose), it elicits a spike in blood sugar. The greater the glycemic index (load) of a food or meal, the greater that spike will be. Generally, refined grains (white bread, pasta, pastries, etc…), sweeteners, and sweets are the major culprits here. Because it knows that high levels of sugar in the blood is dangerous, the pancreas produces and then secretes a hormone called insulin. Insulin is a like VIP tour guide that takes excess blood sugar and brings to your muscle, fat, and liver cells. Without insulin, blood sugar (glucose) cannot enter the cells (for the most part). So, in order for things to operate smoothly, your pancreas must first produce and secrete insulin and, second, your cells must be “sensitive” (or responsive) to it. However, eating a lot of sweet/sugary foods creates a cascade of events that can eventually lead to a condition called “Insulin Resistance” or Diabetes. When this happens, your cells are no longer sensitive to insulin. They’ve simply been exposed to too much of it over the years and thus no longer respond to this important storage hormone. Sugar comes into your bloodstream but cannot be stored in your muscle, liver, or fat cells, which means elevated blood sugar. If, your blood sugar remains for a prolonged period over time, disastrous consequences can arise like retinopathies, neuropathies, and ulcers. Essentially, too much sugar EATS AWAY at the blood vessels, nerves, and other tissues in your body. For the sake of this article, let’s now assume that you have become insulin resistant (that you have Diabetes) like the 26 million other sufferers in the US alone. Under healthy conditions, insulin stores sugar in your cells. It’s a building or storage hormone. You might not like that about insulin but that’s the way it goes. If you don’t want as much insulin circulating in your blood, and thus less sugar stored as fat, then don’t spike your blood sugar with poor quality foods and sweets. When insulin resistance occurs, your cells NO longer respond to insulin. Therefore, no sugar can be stored. At first glance, those wanting to lose weight might think that’s a good thing but let me tell you why it’s not. It also increases triglycerides (fats) in the blood, raising your risk of heart disease. Now, let me help you make sense of this diagram. Insulin resistance is manifested by hyperinsulinemia (too much insulin), increased glucose production in the liver, and decrease glucose disposal. 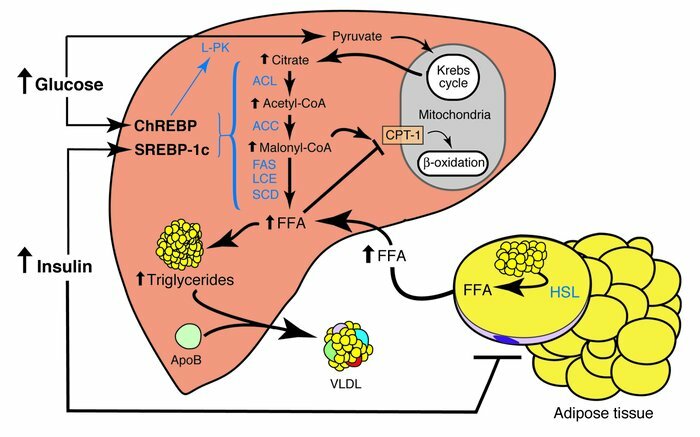 In fat cells (adipocytes) – the yellow globules above – insulin resistance triggers an increased release of hormone sensitive lipase (HSL), resulting in elevated rates of triglycerides breakdown (aka. lipolysis) into free fatty acids. These free fatty acids (FFA) then move to the liver. Converted back into triglycerides for storage OR incoporated into dangerous VLDL particles. Side note: When your doctor measures your “blood triglycerides” he/she is measuring the amount of triglycerides in VLDL particles in your blood. The higher the number, the greater your risk of heart disease. Not only does insulin resistance increase your blood triglycerides via increased VLDL formation but it also activates all of the lipogenic (fat-forming) genes in your liver. This essentially means that more processes occur to convert sugar into fat, rather than energy. Similarly, HYPERGLYCEMIA (too much sugar) causes enzyme processes in the liver to favour the conversion of excess glucose to fatty acids. The trouble with this is that increased fatty synthesis increases production of malonyl-CoA, which then inhibits CPT-1, the protein responsible for fatty acid transport into the mitochondria. As a result, more fatty acids are converted into triglycerides (yet again) rather than being burned as fuel in the cells’ mitochondria. High blood triglyceride levels in the blood (aka. VLDL), which is big time risk factor for heart disease. The American Heart Association (AHA) recommends that a triglyceride level of 100 mg/dL (1.3 mmol/L) or lower is considered “optimal”. Thankfully, this level can easily be attained through lifestyle changes such as diet, weight loss, and exercise. Who would have known that sugar – a molecule related to diabetes and weight gain – could be such a big problem for your heart as well? But after reading this article, I’m sure you can see why sugar (yet again) should have a very very small place in your diet. What you’re putting in your mouth and whether or not you’re moving your body. If you want to avoid heart disease and diabetes (insulin resistance), then start by limiting your sugar intake. Doing so will also improve all other aspects of your health as well! Roger VL, Go AS, Lloyd-Jones DM, et al. Heart disease and stroke statistics—2012 update: a report from the American Heart Association. Circulation. Epub 2011 Dec 15. Konig, L. et al. Sweetened Beverage Consumption, Incident Coronary Heart Disease and Biomarkers of Risk in Men. Circulation, March 12, 2012 online. Jenkins, J. The relation of low glycaemic index fruit consumption to glycaemic control and risk factors for coronary heart disease in type 2 diabetes. Diabetologia, 54 (2), 271-279. 2011. I have type II diabetes so I found this article extremely interesting and valuable. But, I do have a question. Does the sugar also include artificial sugar such as Splenda? No, artificial sweeteners don’t lead to these events. However, they lead to far greater dangers which I’ll probably write about later. There is NO required intake level. Sugar/carbohydrates is the only nutrient class that has no deficiency-related diseases. Kind of makes you think doesn’t it??? My Triglicerides went from 162 to 54 over six months. However, I had an easier quitting cigarettes 35 years ago than I had giving up sugar. I have heard that sugar is as addictive, if not more so than heroine, but I will take their word for it. We use Trevia now, if things need to hve some sweetness, and for steel cut oatmeal, I used fruit (sometime dried fruit) and it seems to work well with the unflavored almond milk. When I walk past the donut section, I sill break out in a sweat. This is a very informative article explaining the processes of how sugar is transformed into Triglycerides. I have been teaching the workers here about how sugar, most specifically HFC, causes havoc in the body to store fat and not naturally occurring fats. So this is very helpful in further explanation. The other component of this health issue is the use of chemically laden cookware/storage ware etc. Different chemicals has been tested (in its preliminary stages) for its effects on beta cells which create insulin and apparently there are at least two (I do not yet know which ones) chemicals that have caused beta cells to create unusable insulin; therefore, now question is whether it truly is sugar (could be a combination of) all by itself causing this problem or that we are also ingesting chemicals (such as Teflon coated pans and BPA plastics). The point is, try to stay as close to nature as possible. My answer to John…please switch to Stevia. Splenda is a chemical which causes more sugar cravings. I would get off Splenda or its called sucralose in the ingredient list. My answer to Linda Sue: most people are getting too much sugar, rarely there’s a possibility that you’re getting less than needed, unless you’re not eating any carbohydrates. In any case, the AHA in its journal Circulation (2009) recommends 100 calories which equates to 25 grams of sugar (remember not total carbohydrates) for women and 150 calories or 37.5 grams of sugar for men. Remember there’s also sugar in whole foods as well, so you should stay under that. Very informative!!! I was always under the impression sugar too much sugar would make your body a feeding ground for Diabetes, and give you unhealthy weight gain. never did i think it could do this. Great article. The one thing I could never understand when I was eating an all raw diet (80/10/10) was why my Triglycerides were always sky high?! An overload of fruit could be at the root but it’s tough to say. Especially, if you’re eating a high fruit with little to no exercise. I knew sugar was bad for one, and I don’t use it any more. What about xylatol? What about honey which is natural does it come under the same as natural fruit? Not quite. I would consider a sweetener and right up there with sugar – ok, maybe one notch down. But this information really applies to any sweetener other than the artificial ones which are a completely different monster. When I was in about 30 the doctor told me to watch my intake of sweets – sugar because there is a history of old age diabeties in our family. I listened and so far I am fine. I also changed my diet about 5 years ago to eat lots of fruit and vegies and do not use can foods if I can help it. I rather buy frozen vegies and fresh also fruit because all those preserv. are not good for you. I also cut back on sodas and drink lots of teas. I make my own teas and got into herbal remedies. I am from Germany and I have several books what teas and foods are good for your imune system and your body to stay alert and to live a long long live without meds. For every time you would get sick there are teas and remedies from nature that can cure you instedt of pills. Those pills/meds can make you more sick than they do good many times. That’s great Cheryl. Good for you for making those positive changes. Another article full of information I need. Will reread a few times, ok maybe 10 times, until I get it. will also pass it on. Yuri this is profound info for EveryBody especially those of us with Diabetes. I have type 1 but I really get the merry go round I am on. Be careful those of who think artificial sweeteners are your answer, get educated it’s worth it. This is a very informative explanation of how this all works. I was especially glad to learn that whole fruit was still quite acceptable. Until I started reading your material (here and in other things you have written) I had thought that all the sugar in fruit was fructose and also had not realized how the fibre can slow down the processing of the fructose to a manageable level for the body. So that is why whole foods can be so much better at times than juices……I get it now. Thanks. It would seem that the first comment from John is also something that isn’t very clear. It is my understanding that the artificial sweeteners & zero calorie sweeteners including Splenda also cause a spike in insulin. Pure Stevia that hasn’t been bulked up to look like sugar was the only zero calorie sweetener that didn’t cause an insulin spike but it isn’t what is being used in sweetened beverages. artificial sweeteners DO NOT cause this to happen. That doesn’t mean you should use them. They are chemicals and have severe neurological effects in the long run. What about dried fruits and resins? Are they as bad as sugar in raising your blood sugar levels? I take about two tablespoons with my oat meal breakfast as a sugar substitute. I wouldn’t overdo the dried fruit but they should be ok since they have the fiber in tact. Yuri, Thank you for the very informative article. I did not know that sugar also causes increase in Uric Acid in the blood. Now I got a very good warning as elevated Uric Acid is my problem. If you don’t mind me asking, what food are good sources of glucose and fructose so that I can avoid the latter. Thanks. Any time you seem SUGAR you’re eating 50% glucose and 50% fructose. The same for high-fructose corn syrup and many other sweeteners. 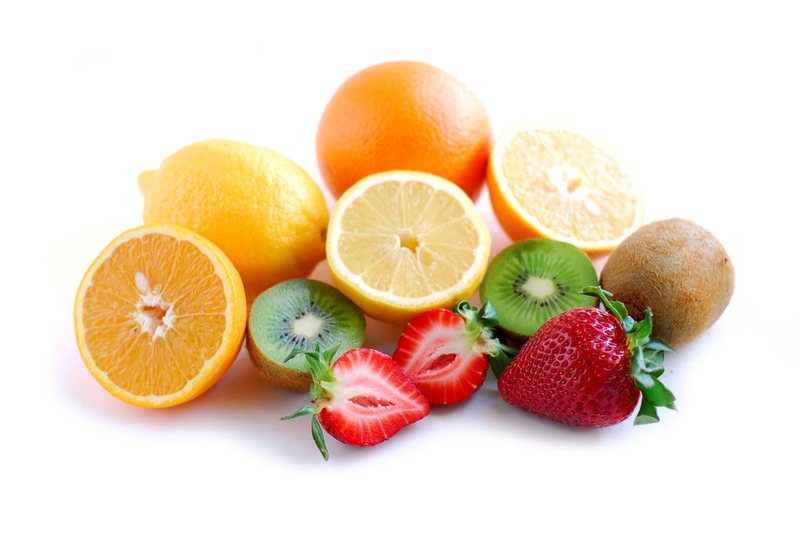 Fruit is ok because it contains a lot of fiber to slow the flux of fructose to the liver. Thank you for the informative article. I have Diabetes Type II and this article helps me stop the intake of sugar. Can I replace the sugar with raw honey? This makes so much sense! I have known for a long time that my habits were making me sick. It has been hard to resist many sweets. But thanks to you and my boyfriend, Brian, I am getting off of sugar and artificial sweeteners. My weight is slowly moving down and my health is moving up! I workout 6 days a week and afterwards i take a recovery drink. Is that too much sugar? The rest of my diet is very clean! So basically make fruit your only source of sugar, seems very simple so far, but what about dates are they okay? Does are higher on the glycemic index but are fine for a post-workout snack. Very interesting article Yuri, as all your posts, thankyou for clarifying the points with diagrams. Thanks again Yuri for a great article, sugar is the new silent ingredient that’s causing heart problems. I heard and tried this for myself. If you have an ant nest that is bothersome (I had one forming near my back door), sprinkle some Splenda over the area. The ants take the Splenda into their nest and kills the ants. Diagnosised with type 2 Diabetes. in 2009 .For last 2 weeks have not been taking my diabetic meds as I was feeling lousy ie no energy and my sugar reading were elevated in spite of increase in insulin. I am feeling much better and losing weight and adjusted my diet to a paleo type eating almost no carbs. However my sugar readings are elevated 10-12 and Im wondering what explaination there is for these reading given i am ingesting very little carb. Does anyone have any ideas? Tanx 4 d article. Is honey any beta? Slightly better. But again good quality honey is important as is moderation. Thanks so much for this article! Seems like Blue Agave Nectar is a big craze these days, what about that? Yuri, I would very much like your take on this youtube video. Perhaps it’s way too long and there is much levity but still would like your opinion. One of the fellows in the video is not well liked by the general youtube viewing public but the other fellow Alan Aragon is well known for his expertise in the despelling of what he considers myths in the fitness and nutrition community. Honestly I believe I already know what your reaction would be, but it’s really hard to confront these individuals with conflicting research into the whole “Sugar Toxicity” debate as they refute it all as biased and almost fruadulant. Looking forword to your response!! Hi Yuri this was very informative. But one question: Doesn´t honey lead till a insuline spike? Depending on the honey the glycemic index can vary but it is generally lower than sugar. Most honeys are in the low to moderate GI range so they won’t spike insulin as high as table sugar. Yuri, if honey is no good either then what do you sweeten your food with, such as Oats? I use maple syrup. The sweetener issue is a tough one but i’ll take a natural form any day, even if it has a slightly higher GI. I just won’t go crazy with it. You can also reduce the GI load by adding healthy fats (ie. flax, hemp) or protein to the meal. Thank you for this information. I know I am a sugar addict and I don’t seem to have much control when it comes to eating things containing sugar. I know that my sugar addiction is serious, much like a heroin addiction I believe. And just like a drug addict, sugar often seems more important to me than my health. I don’t like being in this situation. I don’t have diabetes yet, but I know it’s a huge possibility. I’ve talked to a lot of people about my addiction and they think it’s funny. When I stop eating sugar, I get terrific headaches, I get cranky, I feel extremely tired, I can’t think right, etc, etc. I need help and I don’t know where or how to get it. It’s one thing to read and understand how dangerous what I’m eating is for me. It’s another thing all together to do something about it. I’ve read all kinds of articles, tried to follow a low glycemic diet, tried to just stop eating sugar, but I can never stick to it. Is there anything I can eat, or take, that will lessen the effects of sugar withdrawal until I can get off of it for good? I’m thinking of the methadone clinics that help people get off of drugs. Is there anything like that for getting off sugar? Hey Ruby, I would suggest doing our Total Wellness Cleanse as one of its main goals is to help you overcome sugar cravings. You can also join Super Nutrition Academy and make some immediate headway by learning the truth about sugar, what it does in your body, and start conditioning your body to no longer need it. Yuri when finish the sna course did you receive a diploma a certificate or a other regocnition. Very educative and informative Article. Though I don’t have any sugar or heart relative problem at age 73, I will guide my friends about this. Thanks for educating. Iam 61 with diabetes for last 30 years. IAM POSTING IT ON MY FACEBOOK TILINE,SO AS TO ENABLE MANY MORE FRIENDSREAD &SHARE. Thank you Sir as you are educating many more people against dibetes and insulin. I have a condition (believe it to be candida) that I discovered about 7-8 yrs ago when I stopped smoking. 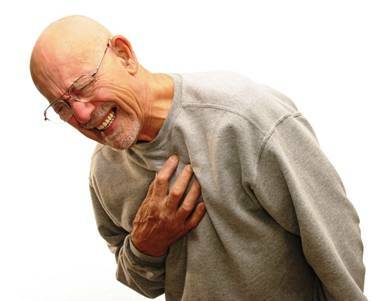 Whenever I eat anything starchy, high GI or carbs (many times the same) I get a a sore throat, just like strep throat. Cut out most all grains, yes, including whole. (virtually starved for the first 3 months, not knowing what to eat. No processed food. – Actually 1 – 3 times a month. 1/2 tsp of honey in 1 cup coffee 2 – 3 times a week, thats all the sweetener I use. Now everything tastes sweet enough. Found eating more fat helped curb the sugar cravings. Olive oil, coconut oil, and grass feed beef, wild animals when I can get it. My Diet is 50 – 70% fat. NO vegetable oils. Think I eat fairly clean and healthy. At least it helps keep my throat in check. What’s your input Yuri? Am I correct or out in left field. Its very great information for us. Thank you so much for sharing with us.